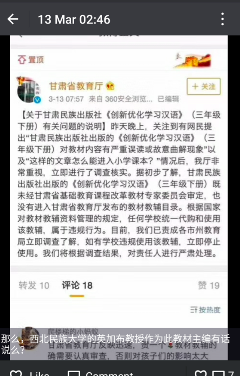 High Peaks Pure Earth has translated a selection of WeChat posts from March this year about a controversial passage in a primary school textbook that had Tibetans outraged about what they saw as misrepresentation and distortion of facts. 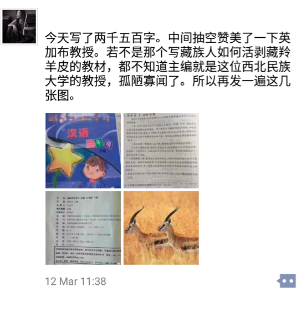 The offending passage in the textbook “Innovative and Optimised Chinese Learning (Grade Three)” was about antelope hunting, with the text inferring that Tibetans hunt and poach antelopes. This is particularly sensitive for Tibetans who are proud of being anti-hunting and actively have protected antelopes. The story of anti-poaching activist Sonam Dargye is a widely known one and he is considered a hero amongst Tibetans for the work he did fighting illegal poachers in the 1990s when there was a high demand for the hair of the Tibetan antelope (chiru) for the shahtoosh scarf. The group he started in 1992, the Wild Yak Brigade, captured poachers and confiscated their equipment and fur. Their story was even made into a popular film called Kekexili (Mountain Patrol) in 2004. Sonam Dargye was killed by poachers in 1994 and this turned into the focus for this textbook controversy. Read the short essay and answer the questions. A journalist joins a group of Tibetans to see how they hunt and kill antelopes. After they discover a group of antelopes, the Tibetans start to chase, while the antelopes run for their lives. When they run onto a overhanging cliff, the animals try to jump, some make it, others fall down. The journalist watches them closely and feels that the cliff is too wide for antelopes to jump across. He eventually comes to notice that some of the antelopes deliberately throw themselves down the cliff and sacrifice their lives so that the others can then step on their bodies to cross. 1. Find the words in the text that you do not know, note them down under the text and then look up their sounds in a dictionary. 2. Is this form of hunting and killing correct? Why? 3. What have you learnt from the antelopes? 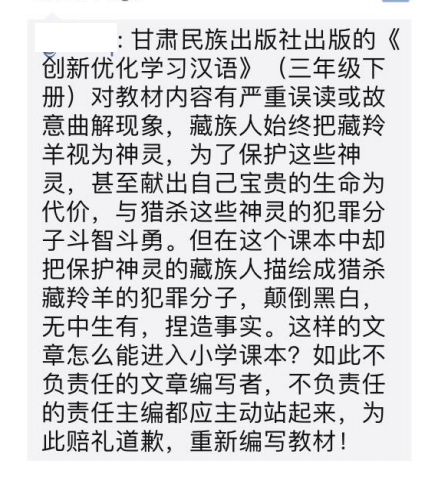 The textbook “Innovative and Optimised Chinese Learning” (third grade) published by Gansu Nationalities Publishing House contained some serious misinterpretations or deliberate distortions. Tibetans consider Tibetan antelopes as spiritual beings and argue and fight with those who ruthlessly murder these spirits; Tibetans are prepared to sacrifice their own precious lives for this. Now this textbook describes Tibetans as guilty of killing antelopes, thus turning black into white, completely fabricating things and inventing stories. How can this kind of article make it into a primary school textbook? The irresponsible author and the irresponsible responsible editor in chief should come forward and sincerely apologise and re-edit the textbook! Has the editor of this textbook actually seen Kekexili? Where in this movie do we see scenes of Tibetans killing antelopes? If you don’t believe me, ask the director Lu Chuan. 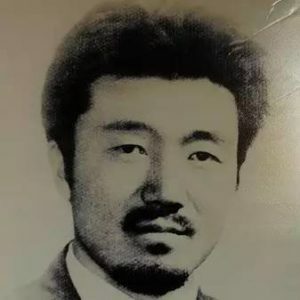 This whole thing really slanders Jesung Sonam Dargye and other Tibetan heroes, in fact against the entire Tibetan people, who sacrifice their lives to save the the Tibetan antelope. Woeser: The textbook by Gansu Nationalities Publishing House is interesting. Whoever writes that Tibetans hunt and kill Tibetan antelopes in this way must be blind. It should be passed on to George Charles, author of “Third Pole Gift: The Wilderness Notes of a Naturalist”. As an authoritative expert who has followed and reported on Tibetan antelopes, he knows that those who hunt and kill antelopes are never Tibetans, but other people. The Gansu Nationalities Publishing House has to apologise. 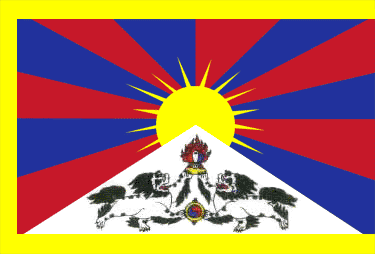 Friend: When I read this, I even thought: so Tibetans do actually hunt and kill. Friend: I remember he also mentioned Tibetans. I will look for it this weekend. But looking at the textbook, it is really nonsense. Woeser: There were definitely some Tibetans who followed the hunting and killing, but this textbook says that the hunting and killing was all done by Tibetans. Woeser: Today, I wrote 2500 words. In between, I want to take some time to praise Professor Yumkyab. Had it not been for this textbook telling us how Tibetans shear the Tibetan antelope, we would never have known about the author, this ignorant and ill-informed professor of Northwest University for Nationalities. So I’m posting these photos again. 8:24am: Comrades, thank you for immediately notifying me about this matter. This is a textbook, I am the editor-in-chief of this series and cooperated with Wang Meirong who wrote and compiled the textbook; the article was again published on the “Lele Ketang” website. When the publisher printed the second edition or when people made illegal copies, they only put my name. Even though the book does not have a wide circulation, it is still important to amend any mistakes. We are currently waiting for an official apology from the publisher. Thank you for paying attention to this. Back then, the author did not notice the mistakes and misleading content. 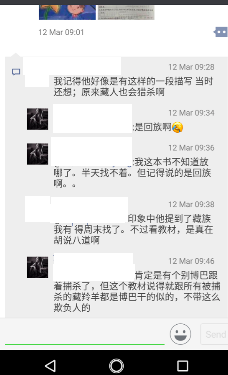 So allow me to first apologise here on “WeChat Moments”. Like everyone else, we are always trying to protect the Tibetan antelope, our artistic and literary works and the positive energy of our ethnic group. Don’t worry, the publisher will withdraw all existing copies of the textbook and promptly amend the content. All the best! 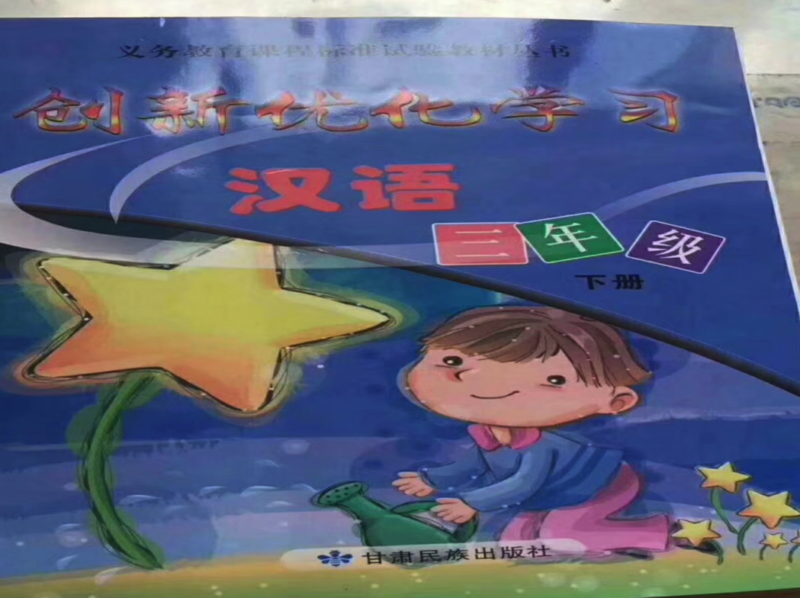 (Explanation about the problems pertaining to the textbook “Innovative and Optimised Chinese Learning” (third grade) published by Gansu Nationalities Publishing House.) 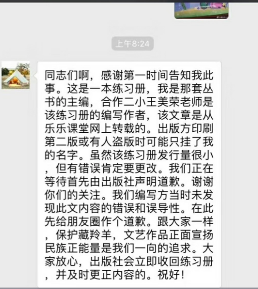 Yesterday evening, netizens pointed out that “the textbook ‘Innovative and Optimised Chinese Learning’ (third grade) published by Gansu Nationalities Publishing House contained some serious misinterpretations or deliberate distortions” and that “it is unbelievable that this textbook could be used in schools”. Our Bureau has attached great importance to this matter and immediately conducted investigations into the matter. 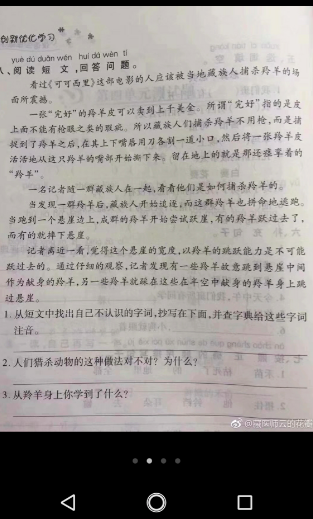 According to initial results, the textbook was not officially reviewed by the Gansu Province Basic Education Curriculum Reform Expert Committee and was not added to the official auxiliary teaching material catalogue issued by the Gansu Province Education Bureau. According to national regulations, any school purchasing or using these auxiliary teaching materials is engaging in illegal behaviour. We have already instructed all education bureaus at city and county level to investigate and, if any schools illegally use these materials, to stop them immediately. Based on the investigation results, any responsible persons will be dealt with in a serious way. 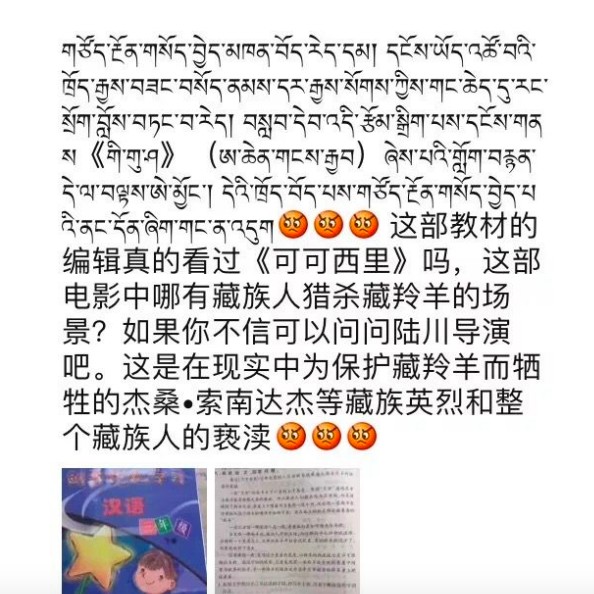 To read a similar story of Tibetans voicing their concerns online and being heard, read about the “Qiao San Die” incident from 2016.